A linchpin in the global warming theory is the claim that we now live in a time of unprecedented warmth. Unfortunately for those who assert this theory, the history books all said it was hot during the centuries immediately before and after 1000 AD – the time known the Medieval Warm Period. “We have to get rid of the Medieval Warm Period” read one email from the asserters, circa 1995, unimpressed that England grew grapes and the Vikings settled Greenland during the centuries they viewed as cooler than today’s. They promoted the theory that, although Europe might have been hot, the rest of the world was not. Except that Chinese experts disagreed. According to the Chinese Academy of Meteorological Sciences, China was one degree warmer during the Medieval Warm Period. The Chinese Academy determined this by looking at records of where citrus groves and subtropical herbs were cultivated at that time – at far more northerly regions than today. As with Europe, the advanced Chinese civilization had a wealth of historical evidence to rebut the claims of the asserters. Other evidence – reported by the United Nations Intergovernmental Panel on Climate Change, no less — shows that Japan was also hot during the Medieval Warm Period. Now comes more evidence still, this time from South America. In a study published this month in the Proceedings of the National Academy of Sciences, researchers at the University of Pennsylvania found that Peru was warm during the Medieval Warm Period. Although South American civilization of 1000 years ago didn’t leave behind a rich historical record for experts to assess, sediment deposits in a Peruvian lake had a story of their own to tell. Based on the researchers’ analysis of the lake bed’s composition over the last 2300 years, they were able to unearth data showing Peru’s temperature to have been in line with that elsewhere during the Medieval Warm Period. 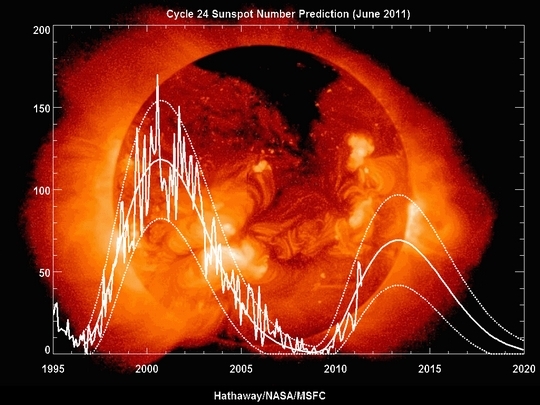 Many solar and space scientists believe cosmic rays entering the earth's atmosphere are regulated by the sun and are a dominant factor in global warming. There's a new IPCC pitch on global warming and if the environmentalists ever catch on, it could be a game-changer. In a move which will be mind-boggling for all those who thought the science of global warming had been decided, and that man-made contributions dwarfed all other sources, despite the disrepute into which the hockey stick et al have fallen, it will come as a surprise that the IPCC is investing the sun, in the belief that cosmic rays are a dominant factor in global warming. Thank your lucky stars to be alive on Earth at this time. Our planet is usually in a deep freeze. The last million years have cycled through Ice Ages that last about 100,000 years each, with warmer slivers of about 10,000 years in between. We are in-betweeners, and just barely — we live in (gasp!) year 10,000 or so after the end of the last ice age. But for our good fortune, we might have been born in the next Ice Age. Our luck is even better than that. Those 10,000-year warm spells aren’t all cosy-warm. They include brutal Little Ice Ages such as the 500-year-long Little Ice Age that started about 600 years ago. Fortunately, we weren’t around during its fiercest periods when Finland lost one-third of its population, Iceland half, and most of Canada became uninhabitable — even the Inuit fled. While the cold spells within the 10,000 year warm spells aren’t as brutal as a Little Ice Age, they can nevertheless make us huddle in gloom, such as the period in history from about 400 AD to 900 AD, which we know as the Dark Ages. We’ve lucked out twice, escaping the cold spells within the warm spells, making us inbetweeners within the inbetween periods. How good is that?